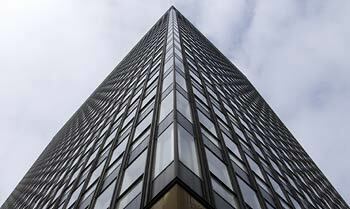 Want some basic tips on how to photograph buildings? Take a look at this article. This article was updated June 2011. We live in them, we work in them, and most of us sleep in them. But what about photographing buildings? Any one who has a camera has probably taking a picture of a castle, local church or tourist monument, but buildings offer much more scope from the intricate details of historical cathedral or the graphical shapes of modern architecture. We take most of the buildings around us for granted and with a little extra perception you'll start to see a whole new way at looking at architecture and its many forms. Any camera from a single-use to a DSLR is capable of recording a decent picture of a building. Wide-angle lens or a compact with a zoom lens - fill the frame from close range and take shots when you normally wouldn't be able to, such as in a narrow street or from a confined viewpoint. Tripod - It's always a good idea to use a tripod, even more so if you're planning on shooting inside buildings such as churches where there's not much light. Full tripods such as those found in Manfrotto's 057 series, which are ideal for outdoor, studio and architectural use, aren't allowed to be used in some buildings so check before you enter. If you find you're not allowed in with your tripod a small support such as Manfrotto's Pocket Series Tripods which fasten to the bottom of your camera, provide a sturdy shooting base, even on uneven surfaces. Monopod - If you're planning on walking around the town you're visiting you may find it easier to carry a monopod for support. Manfrotto's 290 series are lightweight and designed to be portable making them a great tool when you're working out and about. They don't take up as much room as a tripod either so if you're shooting somewhere that's tight for space such as an alley or on a busy street, you still have the extra support without getting in anyone's way. 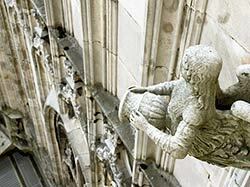 When using a wide angle lens you will find that walls of a tall building lean inwards when you shoot from a low angle. This can be prevented by using a special lens known as a shift lens to correct the perspective problems but these lenses aren't cheap. A less costly way is to find a distant viewpoint and use a longer lens or if you're shooting from close range try and gain height by climbing a nearby hill or shoot from the upstairs window of a building opposite. Specialist architectural photographers take step ladders with them to gain the height. Ideally you want a viewpoint that positions you about halfway up the building any higher and the bottom of the building will start to slope inwards. These correction problems can also be fixed in Photoshop. You may, however, want to exaggerate the sloping walls by shooting wide and going low. When you think about photographing architecture your first thoughts will be to take wide shots of the whole building but you can use a longer lens to home in on small details such as gargoyles on a church or an interesting carving in its masonry. When you think about photographing architecture your first thoughts will be to take wide shots of the whole building but you can use a longer lens to home in on small details such as gargoyles on a church or an interesting carving in its masonry. Look for more obvious subjects such as clocks, spires, sundials and stone carvings then turn your attention to shooting repetitive patterns. These can be found in the brick work or when you zoom in to show a row of roof tiles or windows. Try shooting from an oblique angle and the perspective will change dramatically creating lines disappearing towards a vanishing point. Don't overlook the ugly looking buildings either as most of the time, once you're zoomed in and focused on one part, you'll find great architectural patterns. If you can climb up to the rooftop of the church or cathedral you're photographing do as doing so present many photographic opportunities. As well as gaining you a great viewpoint of the city you can often find interesting statues projecting out from the walls. 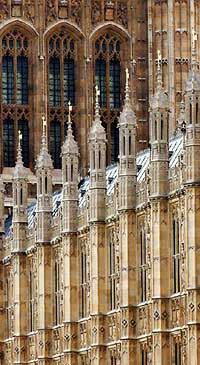 A 200mm telephoto shot of the houses of parliament building in London. Most pictures you see of these famous buildings show the whole structure. By cropping in tightly you can highlight the fantastic repetitive detail and make an interesting pattern. 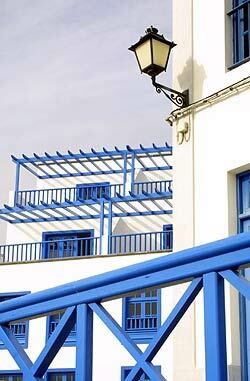 The 80mm end of a 28-80mm zoom was used here to crop in on these apartments in the Canary Islands. The rule of thirds (was used, placing the wall and blue railing on the intersecting lines. If you venture inside brighter buildings that are lit by fluorescent or tungsten lighting you can get colour cast but your camera's automatic white balance control should fix this problem. If not, switch to manual and key in the appropriate setting, checking the LCD preview to see the effect. Buildings are one of the easier subjects to measure light from. In most cases the brick or stone is a similar tonal value to mid grey so the meter will record it accurately. Problems will generally only occur if the material used is very dark (coated glass) or very light (white painted structures). 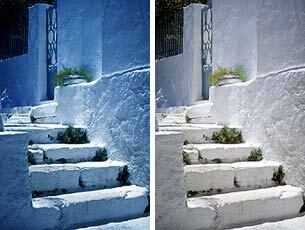 In these cases the camera will compensate making a dark building too light and a light building too dark. As a result you'll need to open up a stop or close down one stop to compensate or if your camera has exposure compensation set either -1 stop or +1 stop respectively. If you have an auto exposure lock point it at your hand (if it's in the same light as the building) and lock the exposure. One other area that can fool the camera is when the sun is behind the building and in the frame. The bright area will fool the camera into setting a shorter exposure and the building will become silhouetted. Point down so just the building is in the shot, take a reading and recompose using manual or the auto exposure lock. To shoot a well known building slightly differently look for ways you can add other elements that are around to your shot. This could be using the side of a modern building as a mirror to capture an older looking structure, finding a puddle, as in the shot to the bottom left, to give a typical architectural shot more impact or it could be by using an arch, hedge or tree branch to create a frame for your shot. 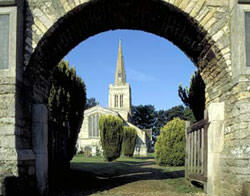 Above: Use an arch or tree to provide a natural frame around your picture. 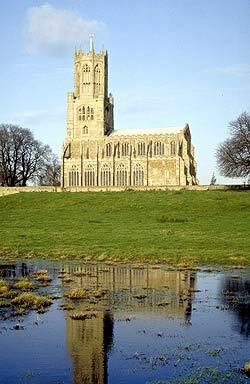 Left: In this shot at Fotheringhay a huge puddle was used to get a reflection of the impressive church. This adds interest to a shot that could have ended up being just another horizontal view of the church. You don't have to shoot in colour all the time. Black & white makes an often more dramatic alternative. This shot of a plain looking building has been improved by shooting on infrared. 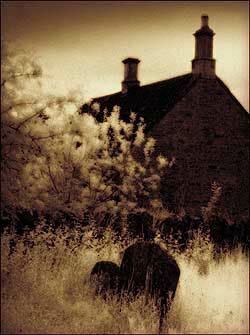 In Photoshop the sky was then darkened, increasing the glowing areas of the foliage and a sepia tone was added. 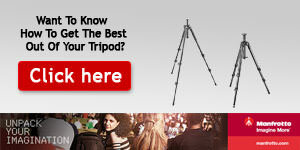 Find the tripod to suit your needs at www.manfrotto.co.uk. very nice article. Just adding to your great advice, don't forget to look at both the positive space as well as the negative space the interior space creates.